In the first act of “The Crytpogram” the comedic potential of David Mamet’s easily recognized, clipped, stylized, supposedly conversational dialogue sometimes pops up from the mire of simmering domestic duress. Nearly self-parodic in spots, but too knowing and well-written to be dismissed as such, the terse but dense exchanges are at times just plain funny. Go ahead and laugh. By the third act, the script is as stripped of humor as the stage is of home furnishings. A big reveal midway through the show puts a stop to any comedy. A perilous but unresolved ending suggests tragedy. Much of the humor derives from how the most mundane aspects of conversation are treated with urgent emergency or relentless inquiry. Once we start to see real threats mount, the stylistic yet human wordplay veers from humorous hyperbole and quizzical riddling toward ineffectual, hopeless, increasingly aggressive, occasionally annoying chatter. Everyone can play around with words when skirting the issue; when the truth starts to crack through, there’s no fun left in the contest. It’s a shift in tone that mirrors the journey of the play’s three characters, and is expertly executed by the playwright and wonderfully realized in this Profiles Theatre production. This 1950s nuclear not-quite-family is compromised of mother Donny (Abigail Boucher), young son John (Aaron Lamm), and family friend Del (Darrell W. Cox). Donny speaks most naturally of the three and engages least in the propulsive, inquisitive, elliptical speechifying-as-speech. Her son is constantly getting swept up in his own declamations; he’s wound so tight it’s no wonder he can’t sleep. He may suspect if he gets some rest that when he wakes up he’ll see there are no nice answers to his incessant questions, most particularly those concerning when his absent father will finally arrive. And Del is most at ease as mouthpiece for this uncommonly touching strain of Mamet-speak, as if he’s been through these loops more than enough times and now hopes that instead of winding him up like the youngster, the circular questioning can function as mantras to calm him. But he’s no less frightened of the likely answers than the child is. To fully succeed, this play requires an almost preternaturally gifted child actor. Lamm is strong in the role, generally maintaining fluidity in his rapid delivery and exhibiting a good balance of understanding and perplexity over what he’s saying. Mamet’s text delivered from a nagging kid in pajamas sounds intriguingly spot-on and revealing, as if an indication his famed style originates from and is best suited to a child (making the grown Del seem ever more childish in his continued use of it). Cox is remarkable as Del. His command of the demanding dialogue goes beyond complete; after just a few moments it’s impossible to imagine him speaking any other way. Del is sadly nervous for someone so defeated—a character utterly unable to break out of his failings, who instead strenuously tries to evade them. Though Donny’s frustration over her son’s willfulness and her anger with Del’s betrayal both eventually explode, Boucher emotionally grounds what would otherwise be the untethered ramblings of two generations of males. The missing male here is the father. He’s represented by a phallic symbol/heirloom/weapon which is bereft of the heroic import he had ascribed to it. Furthermore, as Donny suggests late in the show, there are no true men in her world. 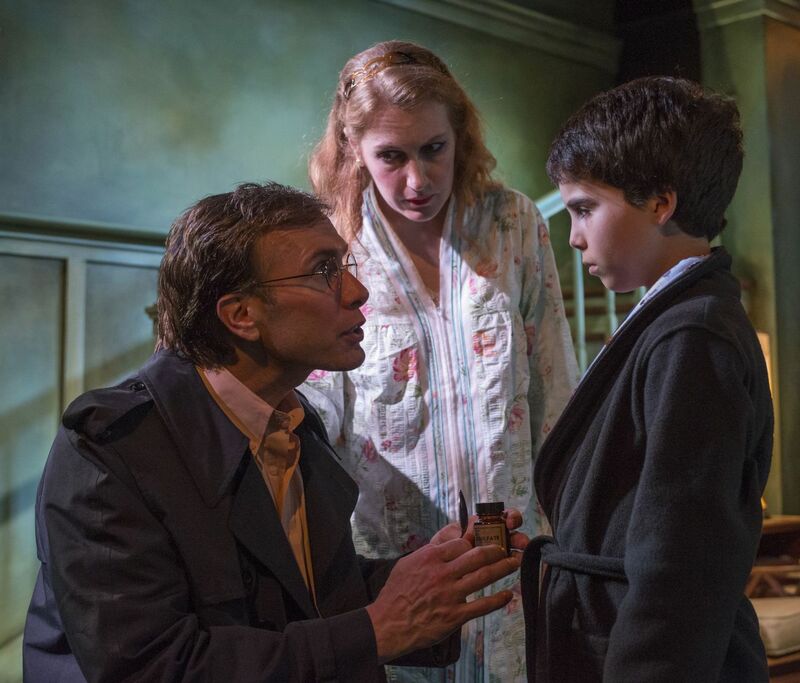 From the show’s program, and from what seems prevailing interpretation, “The Cryptogram” presents a child looking in on a confusing adulthood as his own innocence fades. But what I saw even more clearly in focus was the impossibility of attaining manhood. The father is represented by an object that could kill or emasculate a fellow, and has fully abandoned his familial duties. We have reason to doubt John will grow much older, as by the end of the play the two adults have abdicated their responsibility for him to the sharp, dangerous substitute for his father. And Del, who we see from the beginning is quite capable and interested in being paternal to the boy and loving to the mother, becomes insurmountably tongue-tied and cripplingly weak whenever he tries to voice what he can offer. He’s too full of self-loathing, or at least too self-conscious, over his sexuality to see how either he or Donny could ever consider him man enough for the job. Indeed, in the absence of John’s father—the real betrayer—Donny takes it all out on Del, assailing his masculinity in her anger. Profiles Theatre, The Alley Stage, 4147 North Broadway, (773)549-1815, profilestheatre.org. $35-$40. Through November 16.